I remember a time, back in the 80�s, when all I wanted to do was spent all my time and money inside an arcade. This was when Pac Man first came out and it stuck a chord with youth that had everyone going to arcades to play it. Buckner and Garica recorded the song Pac Man Fever and I had to have it on cassette. Arcades flourished throughout the 80�s and I used to get together with my friends to play Street Fighter II at the Circle K near Robinson High School. Also, the home console market was doing well with the Atari 2600, Colecovision, Intellivision, and the original Nintendo. Soon home consoles were the way to go and sometime in the 90�s, arcades were a distant memory. Having grown up going to arcades as long as I can remember, I was feeling broken hearted. That was until I took my first trip to Japan and saw all the arcades there. At first, Japanese arcades seemed exactly like their American counterpart but there was something different about them that needed a guide to point the way. 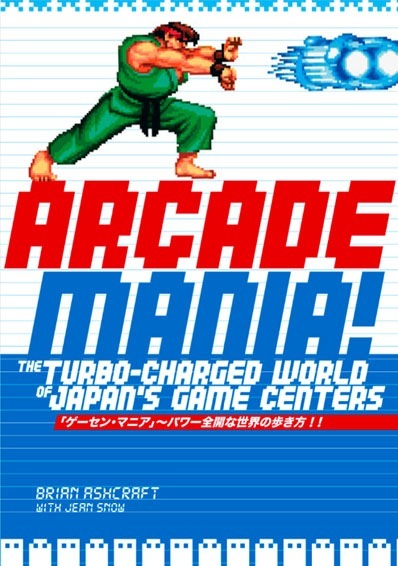 That�s why a book like Arcade Mania is needed as a look inside Japanese game centers. The best part of the book is the layout. If you and I were to travel to Japan and go inside a game center, the chapters correspond to what you would see first, the crane games. Those games that test your patience as you try to maneuver a crane to pick up a stuffed animal or any of the numerous prizes inside. The author, Brian Ashcraft, does a good job going into the history of crane games, as well as, providing interesting interviews with key people involved such as developers and people who are experts at winning. This format of interviews with developers and experts is repeated for all the different chapters. Next up is Purikura and Japan�s obsession with the cult of cute. Purikura are the sticker pictures that you have made inside machines. You get together with your friends and choose from many different backgrounds and the machine takes several pictures of you and your job is the pick out the best one, the most glamorous , because the machines are set up to make you look cute regardless if you are cute or not. Some Japanese have gotten jobs by taking beautiful sticker pictures and attracting the attention of modeling agency or becoming the poster girl for the company that manufactures the machines. So if you are feeling sick of all this sugary sweetness it is time to step inside the game center to check out the rhythm games like the most popular one, Dance Dance Revolution. I must confess that I was not very good because I have two left feet. However, my buddy, Colin Williamson, was very good and drew crowds every time he played. Arcade Mania covers all your favorite cabinet games and especially my favorite genre, fighting games, and the phenomenon created by Street Fighter II. It was a beloved game that I first played in the early 90�s during my college years in the US and when I went to Japan, I was glad to see all the different versions and new cabinets coming out for the Street Fighter series. Going to Japan was a dream come true for me. You could walk into a game center as a young kid, college student, middle aged dude reliving his youth, or someone retired and no one would care. There wasn�t this stigma that video games are just for children. Overall, Arcade Mania is a good read that provides some interesting tidbits of history.On the downside, the writing is very causal and comes across like reading a magazine article or a blogger. This is a certain shallowness that once you read it, you will forget it. I wish that Ashcraft would have provided a lot more depth. He is the Senior Contributing Editor for Kotaku, a video game website and with all his knowledge the writing in certain chapters feels weak. However, when he is really interested in a certain game that enthusiasm does come across and then Ashcraft will hit a genre that he isn�t that fond of and the writing becomes uninteresting. With all that, Arcade Mania is still worth your time with beautiful pictures and at times adequate text. For a more in depth look at video games I suggest The Ultimate History of Video Games: From Pong to Pokemon�The Story Behind the Craze That Touched Our Lives and Changed the World by Steven Kent. So don�t despair that the only games available in the US are dusty Donkey Kong cabinets wasting away inside some long forgotten pizza parlor, because you can always take a trip to Japan and get lost in one of the many hundreds of arcades still around.